Are you wondering how to introduce chapter books to your kid AND to maintain his/her attention on the story during your read aloud session? Is there a way that you can introduce chapter books to your child, while avoiding rejection and disappointment? My advice - before you open the first chapter book - make sure that both you and your kid are ready. Chapter books are also supposed to be fun, so help your kid have a blast! In short, you cannot simply bring any chapter book to your kids and ... start reading. As with any good friendship, you must ease into this new friendship slowly. Before you even think about chapter books, make a habit of reading as many picture books as possible together with your kid. Establish a strong reader-listener relationship that is built on a wide variety of good picture books. Read as often as possible so that one day the inclusion of chapter books will come naturally as an extension of your regular read-aloud sessions. Although most parents are aware of the significance of picture books, I must stress - please do not try to replace picture books with chapter books! This is about including chapter books in your daily reading menu, not about nudging picture books out of the ... hmmmm.... picture. Although there is no magic pill that can help you introduce chapter books effortlessly , let me share my experience. One day when my twins were about 3 years old, I decided to try to include a chapter book in our daily reading program. I wanted to expand our reading experiences, because I sensed that my twins would be able to follow a story in short chapters over several days. There was a problem. I simply did not know which chapter book to start with. Well, I found such a book - completely by chance. Beverly Cleary's Two Times The Fun! Yes, this was the first chapter book that I read aloud to my twins. And here is the catch - but don't tell anyone - it's not really a chapter book. But that's a technicality. This book works as a chapter book perfectly and it is beautifully illustrated with modern and exciting illustrations by Carol Thompson! Originally, I purchased this book to read one day so that my twins would get a glimpse at the life of another pair of twins. 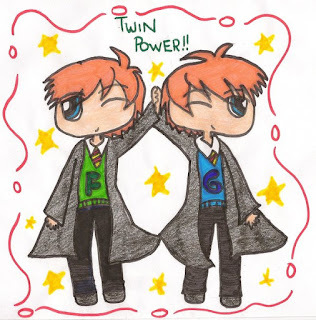 I guessed that if I was a twin, I'd like to read about another pair of twins - just to get a new perspective. The main characters are twins Jimmy and Janet, a boy and girl who seemingly lived a similar existence to my own kids. When I received the book, I leafed through it and said to myself "This is it!" 1. This was clearly great read-aloud material and a really, really fun book book for adults too. So, if you are planning to start reading chapter books with your kids, let me assure you you cannot go wrong with this gem penned by Beverly Cleary! 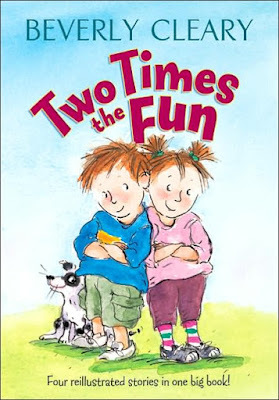 Two Times The Fun is really a compilation of four stories that were originally published as four separate picture books (The Real Hole, Two Dog Biscuits, The Growing-Up Feet and Janet's Thingamajigs). We are talking about four perfect "chapters" for the first perfect read-aloud. Story (chapter) no. 1: The Real Hole, is about Jimmy's decision to dig a big hole in the backyard with a real shovel. His dad find's him one and Jimmy's persistence pays off. He manages to dig the hole, while Janet attempts to find a use for the hole. As the twins cannot agree what to do with the hole, father buys a spruce tree and they all plant it together. Story (chapter) no. 2: Two Dog Biscuits is a charming look at how Jimmy and Janet get attached to two dog biscuits that they bring from the neighbor's house. As they keep moving the biscuits around the house, Mom takes the kids out for a walk to find a dog to give the biscuits to. Alas, no dog fits the bill so they finally give the dog biscuits to a cat. Story (chapter) no. 3: The Growing-Up Feet is a story about Jimmy and Janet going to the shop to buy new shoes with their Mom. Although they find out that their feet have not grown sufficiently for new pairs of shoes, Mom still buys them new red boots. Now the twins are so taken with their boots, they don't want to take them off. As there is no rain (and no puddles), Dad decides to wash his car to make puddles for the twins to try their boots out (and to show off in front of the mailman Mr. Lemon). Story (chapter) no. 4: Janet's Thingamajigs - The twins' mother calls little objects 'thingamajigs', so Janet starts copying mom. Janet starts making a small collection of her own 'thingamajigs' (buttons, thimbles, etc.). As Jimmy grows envious and wants to play with the little objects, Janet starts hiding them in paper bags and starts sleeping with paper bags in her crib. As her bed overflows with 'thingamajigs' - mom decides to buy new big beds for the twins who are overjoyed! The great thing about the book is that it does contain pictures, although keep in mind - this is not a picture book. Easy reading, fun story, captivating events for listeners and the enjoyable characters of Jimmy and Janet. You can't miss with this one!! Now you know how we started to read chapter books. 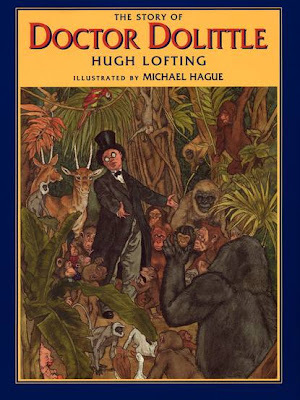 I'd love to know what was the book that you used to introduce chapter books to your kid(s)? P.S. Our next read-aloud chapter book was Enid Blyton's The Enchanted Wood. Ooooh, that book also hit a home run! You can read my review here. We started with 'My Father's Dragon' and 'Wolf Story' when my little one was 3 and a half. However, we had been listening to 'My Naughty Little Sister' before she turned three, which is another cheat chapter book. Great choices to start chapter books! I've never heard of "My Naughty Little Sister", we will have to check it out!